Electromobility is on the rise, because in the cities of tomorrow it will be predominantly electric cars that will be used to reduce the pollution caused by traffic. Electromobility is on the rise, because in the cities of tomorrow it will be predominantly electric cars that will be used to reduce the pollution caused by traffic. The heart of every electric vehicle is the battery. If more and more cars are equipped with electric motors, the demand for batteries will increase. In order to make their manufacture electrically safer, Bender has developed the new insulation monitoring device isoBAT425. The isoBAT425 is intended for monitoring the insulation resistance and the voltage of a battery during its assembly from individual battery cells. It monitors the insulation resistance of batteries with nominal system voltages of DC 0…400 V. The maximum permissible system leakage capacitance Ce is 1.0 μF. The isoBAT425 measures the insulation resistance RF and the leakage capacitance Ce of the battery to earth. In addition, the voltages Un between L+ and L-, UL+e between L+ and earth as well as UL-e between L- and earth are measured. The first step consists of assembling the battery in two parallel strings (plus and minus string) which are not interconnected. During the second step, the two strings are connected to form a complete battery by means of another battery. The resulting measured values allow diagnosing the type and location of the insulation fault. In the LC display, the fault location is marked with a plus or minus sign preceding the value RF. 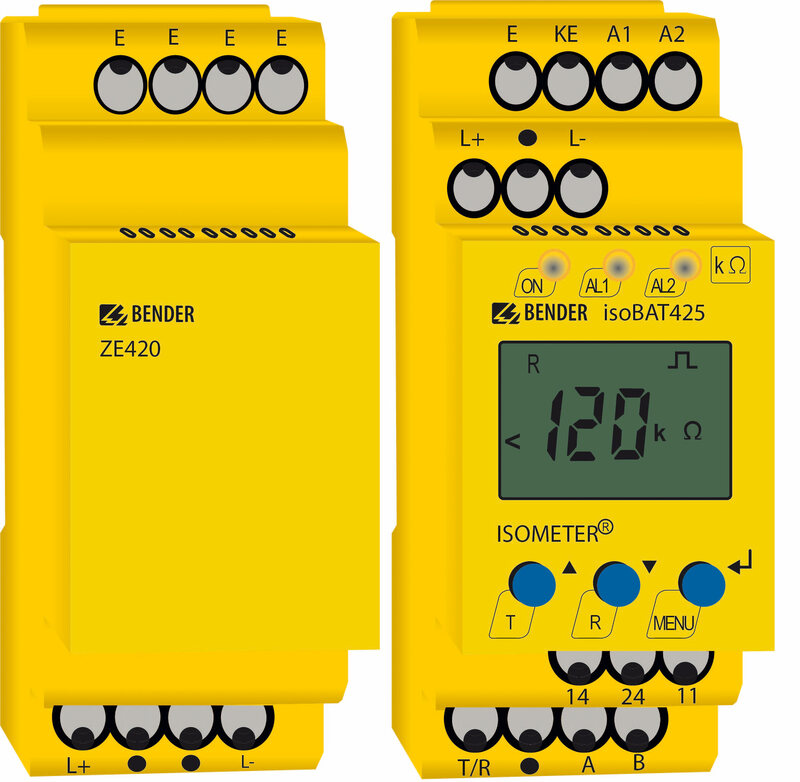 For open battery strings, the ZE420 terminal element provides a “low-resistance” connection (10 kΩ) between the terminals L+ and L-, necessary for the measuring functions of the isoBAT425. An optional 1.5 mA current limitation is used in series with this resistance. It starts above Un = 25 V and increases the internal resistance of the terminal element. For this reason, in the event of a cross fault the system connection monitoring may be additionally triggered.